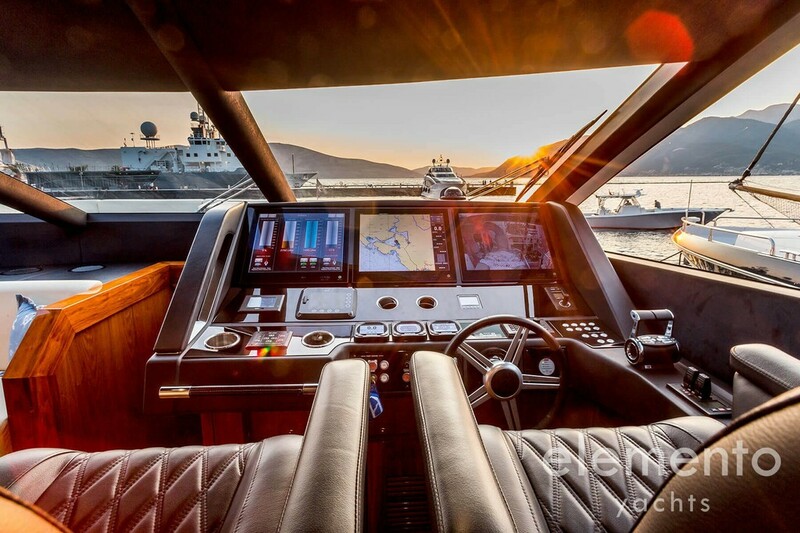 Welcome to the “STARDUST” — Sunseeker 86 Yacht. 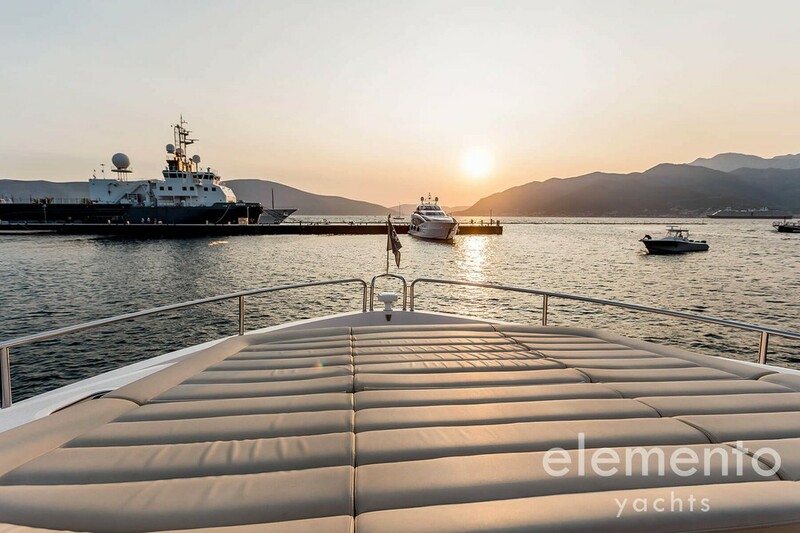 This luxury super yacht is berthed in the port of Palma, from where it drops off for charter on the Mediterranean Sea of ​​the Balearic Islands. 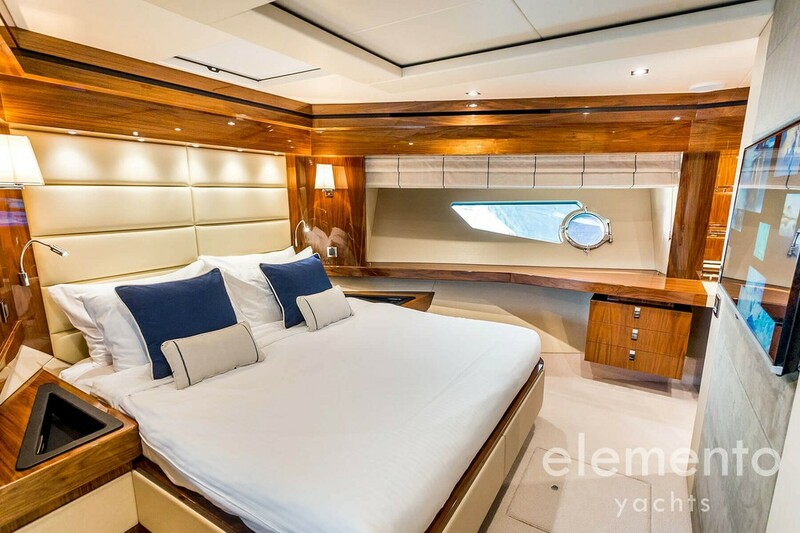 Built in 2015, the “STARDUST” has a total length of 26.30 meters. 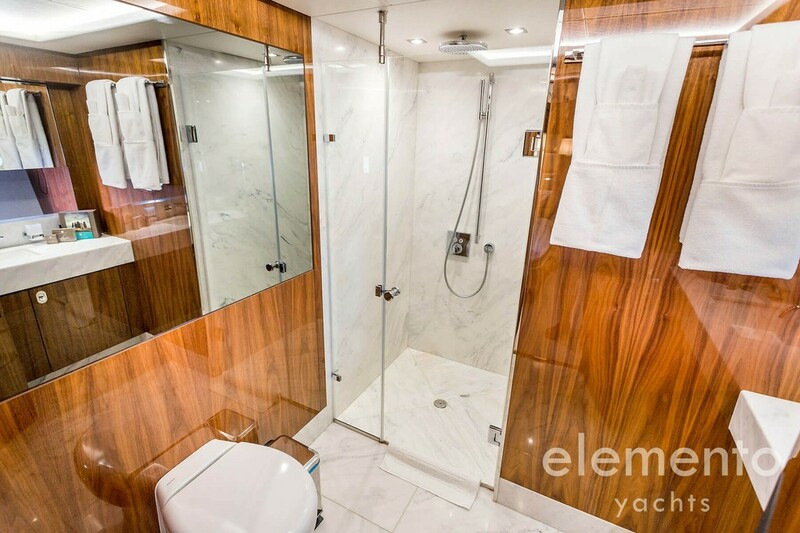 In four elegant double cabins with one bathroom each, up to eight guests can fully enjoy the yacht holiday. 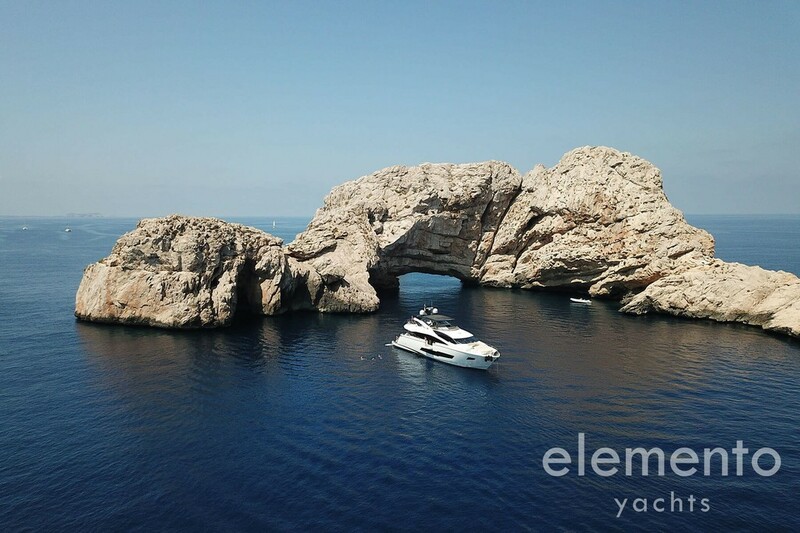 Up to twelve guests can spend a fantastic day charter on board. 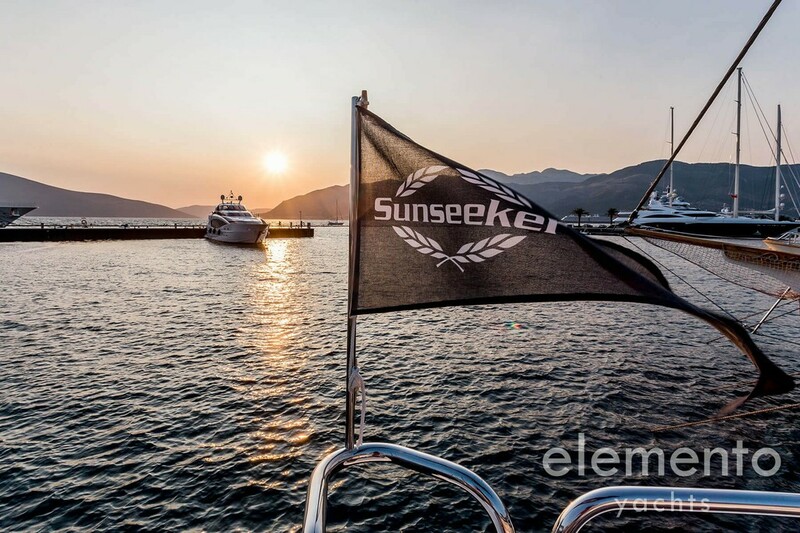 The generosity and exclusive features of the Sunseeker 86 Yacht “STARDUST” make your stay on board an unforgettable experience. 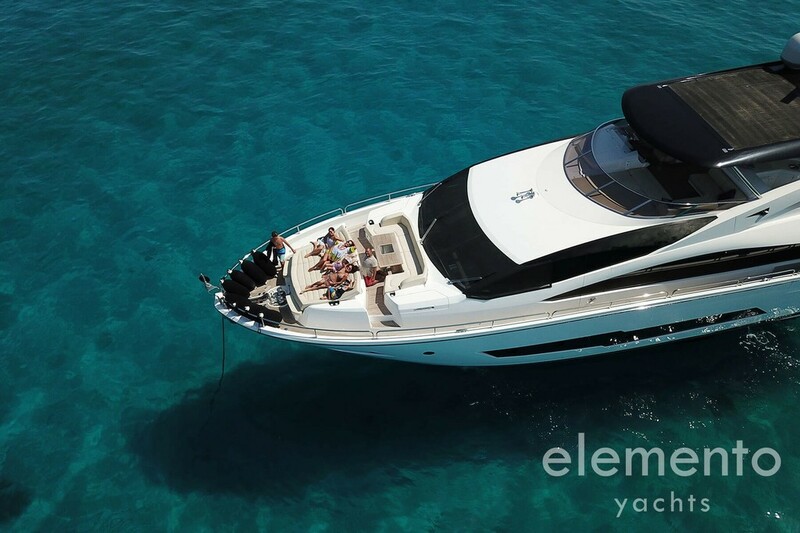 This super yacht is perfect for a yacht charter with family and friends in Majorca. 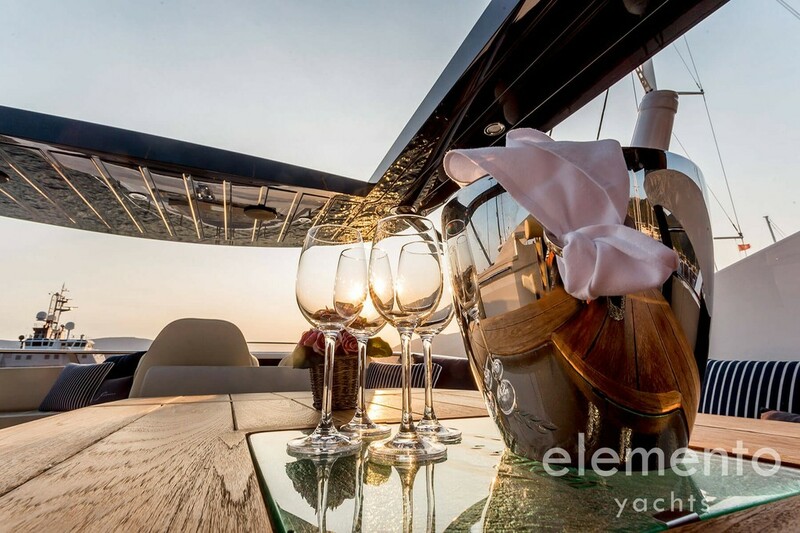 The four-man crew consisting of captain, deckhand, stewardess and chef takes care of the wishes of the guests. 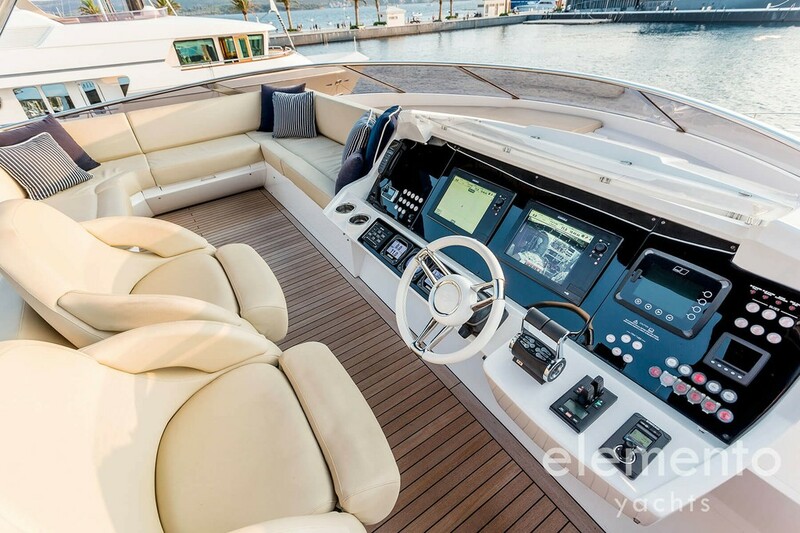 The design of the Sunseeker 86 Yacht is modern and elegant. 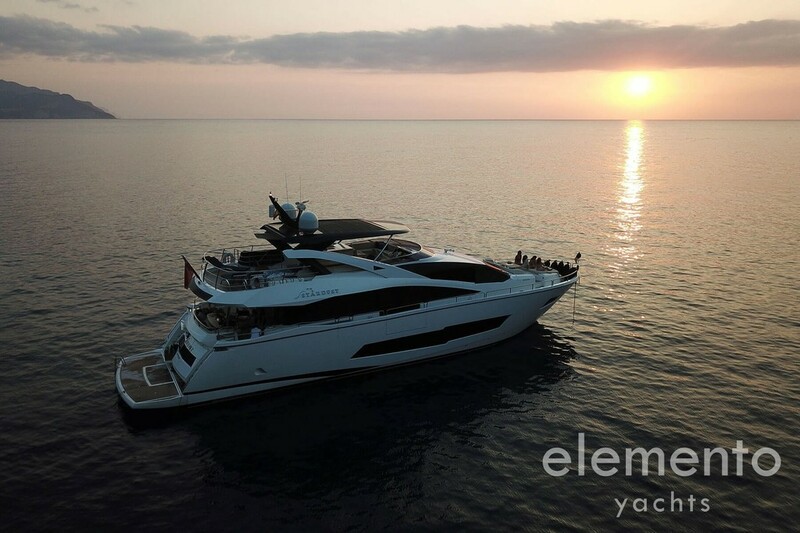 Two MTU engines together generate 3,900 HP, which gives the large yacht a very good performance. 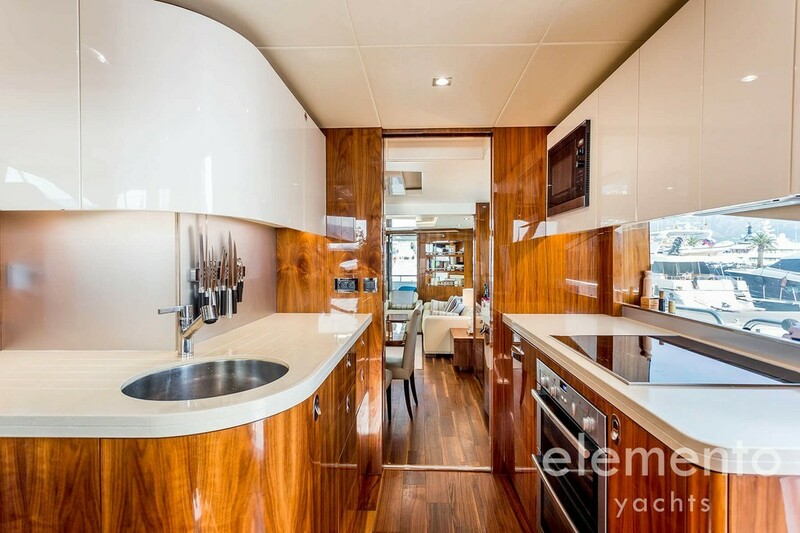 The cruising speed is 22 knots and at maximum speed you travel comfortable with 30 knots over the sea. Ibiza city can be reached in about 2 1/2 hours. 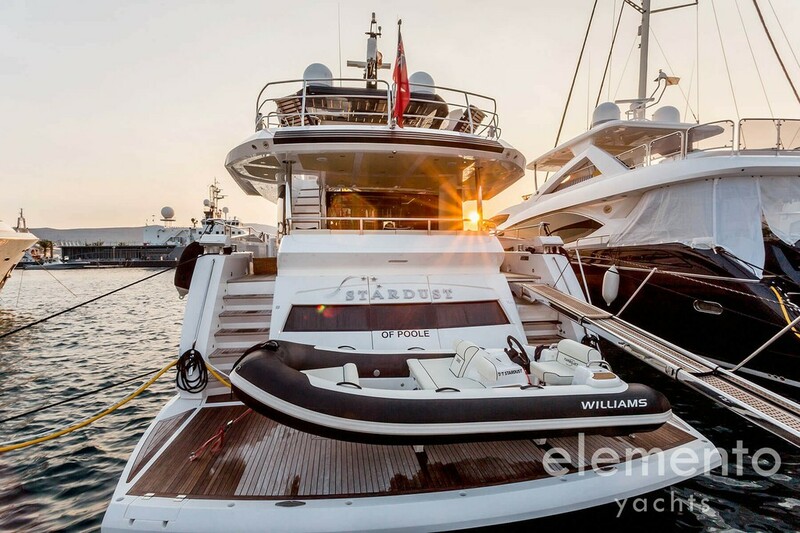 On deck the “STARDUST” — Sunseeker 86 Yacht impresses with a noble ambience and perfect equipment. 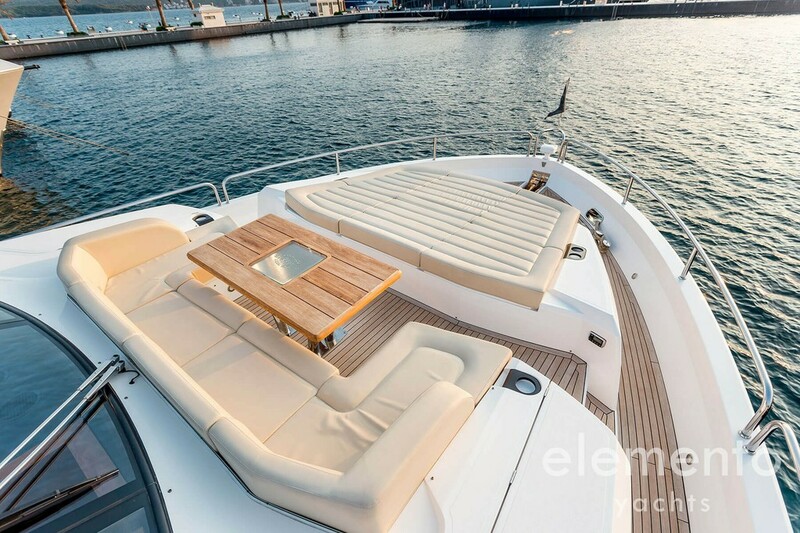 On the bow of the yacht there is both a large sun lounger to relax and benches with a nice dining table. 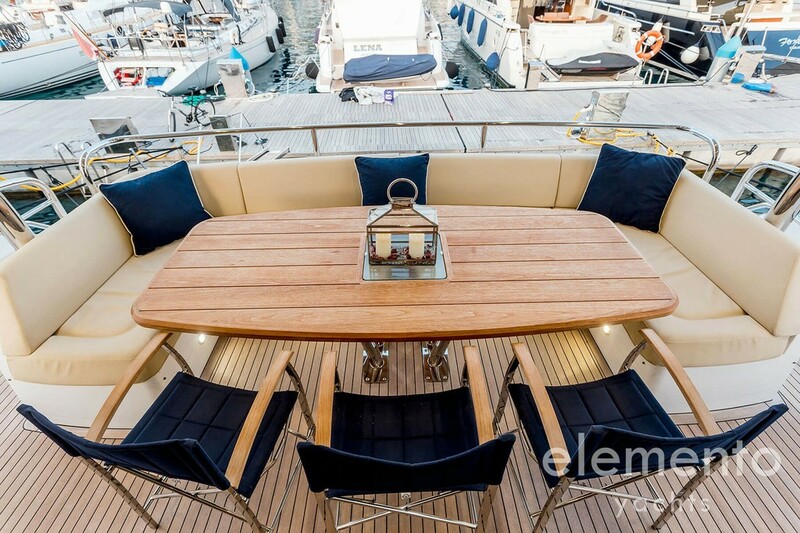 At the aft deck, the ship has again a comfortable sitting area with dining table. 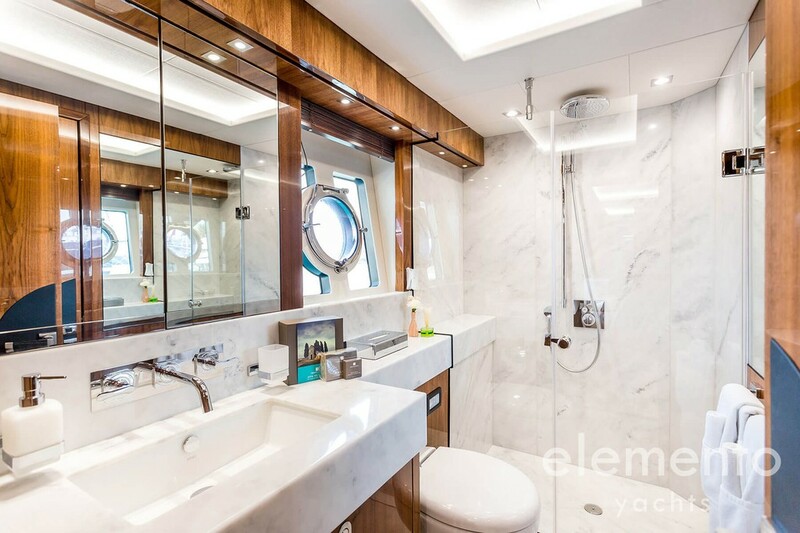 At the stern of the “STARDUST” is a huge bathing platform, on which the dinghy is housed. 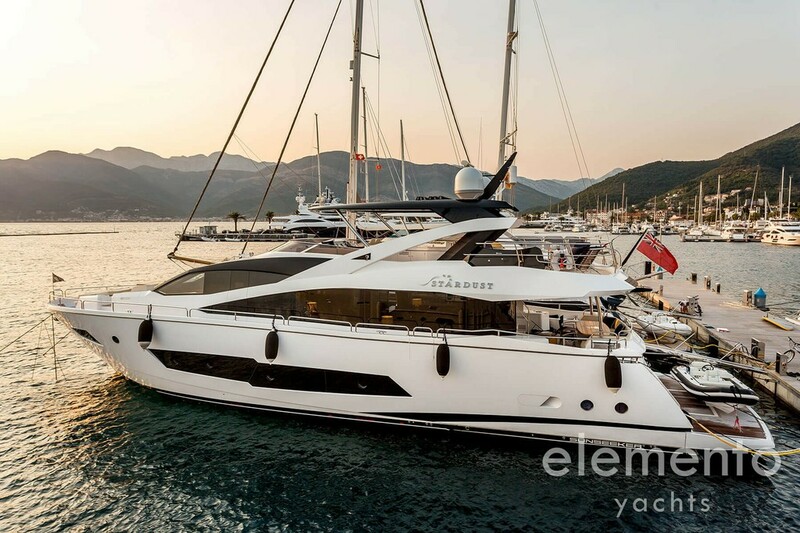 The highlight is the excellent flybridge, which is protected by a bimini hardtop. 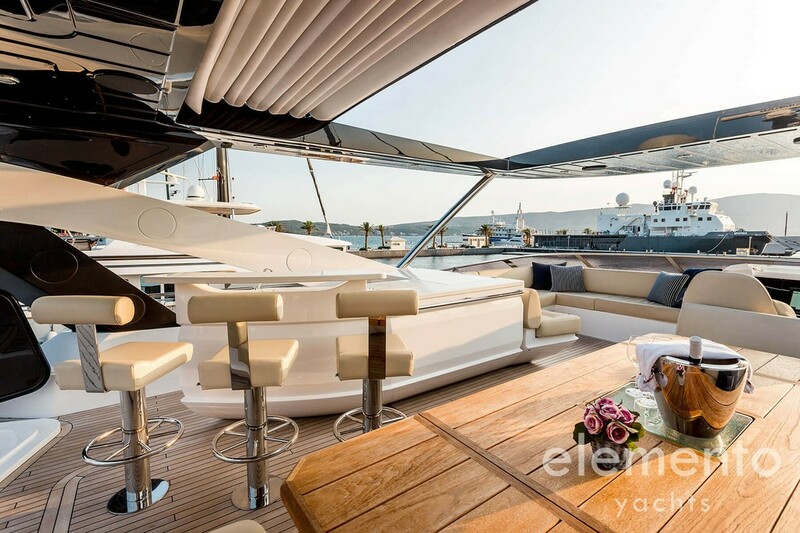 The bimini can be opened for sunbathing. 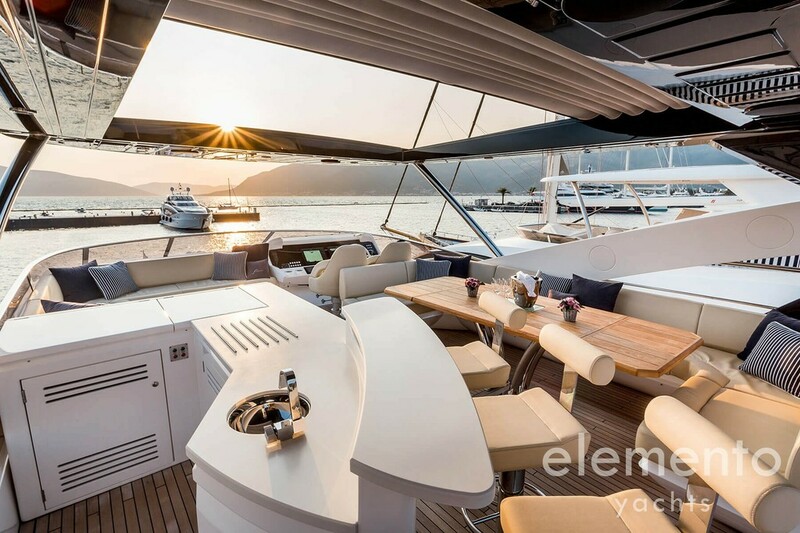 Again, there is plenty of space to dine and relax. 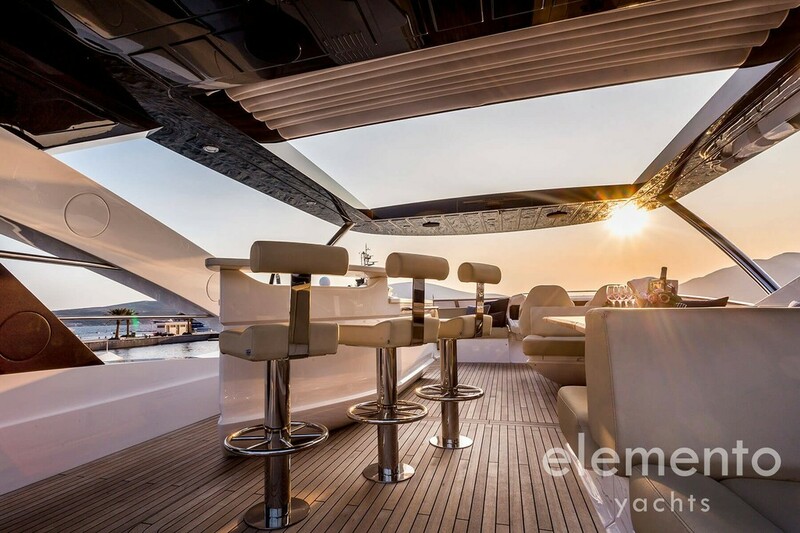 Various seating and lying areas invite you to linger. There is also a small outdoor kitche. 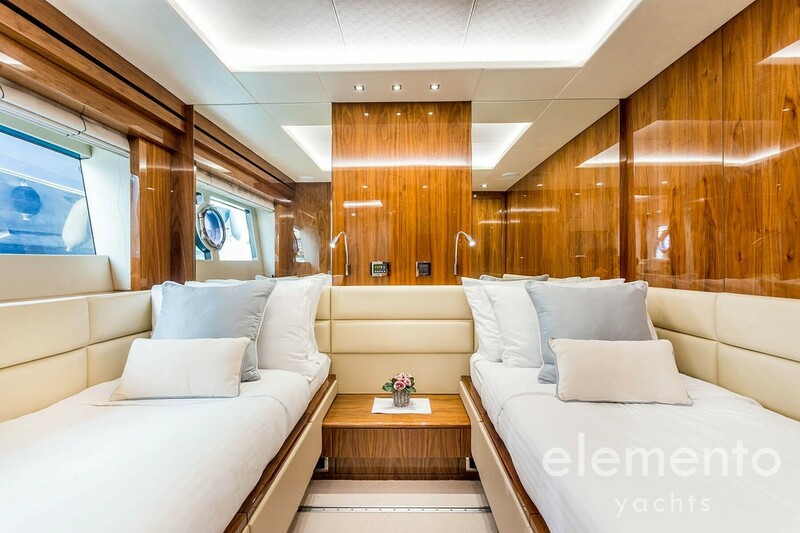 The yacht leaves nothing to be desired on deck, as well as in the interior. 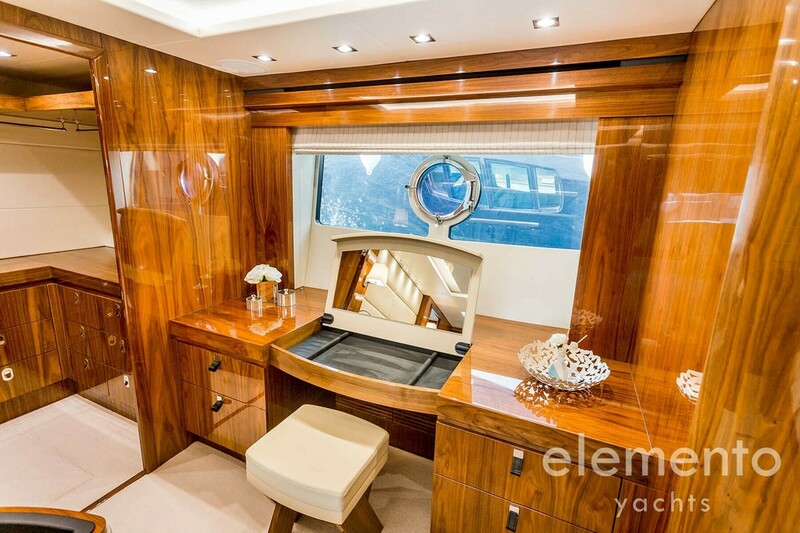 The interior of the “STARDUST” — Sunseeker 86 Yacht is very classy. 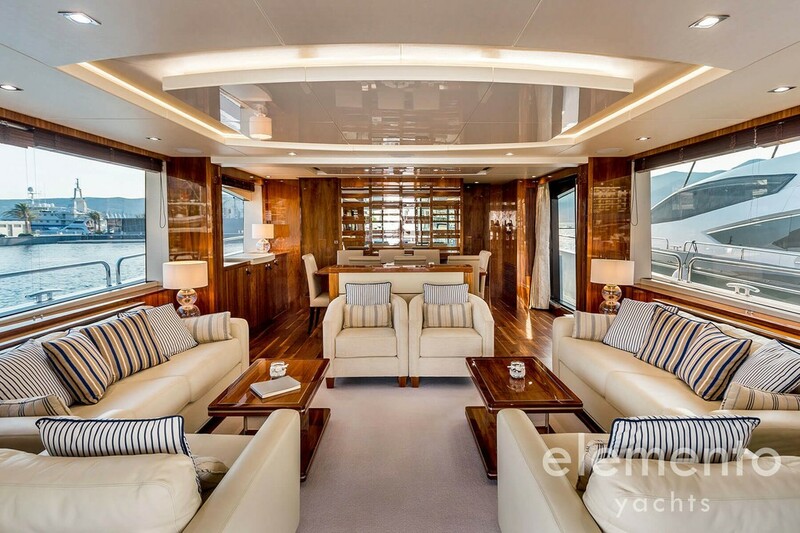 Large windows allow plenty of daylight into the interior, which makes the furniture and high-quality materials shine in full glory. 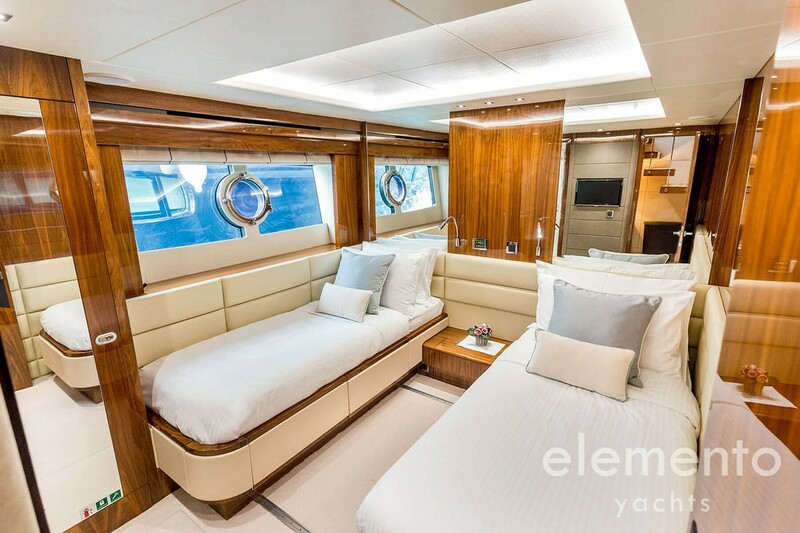 The highlight of the super yacht is the balcony, which can be dropped down on the right side. There you have a nice place to enjoy the evening sun. The salon and the dining area are separated by a fall TV. 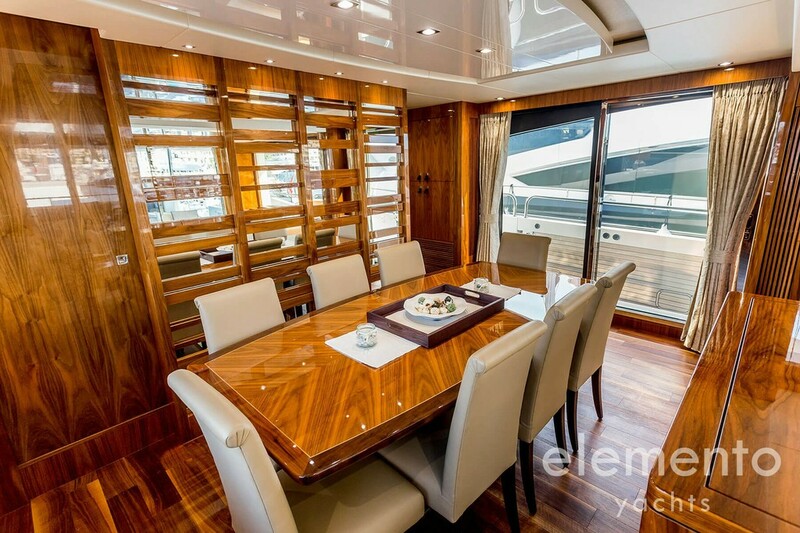 The kitchen is just behind the dining area. So the stewardess can serve her guests well. 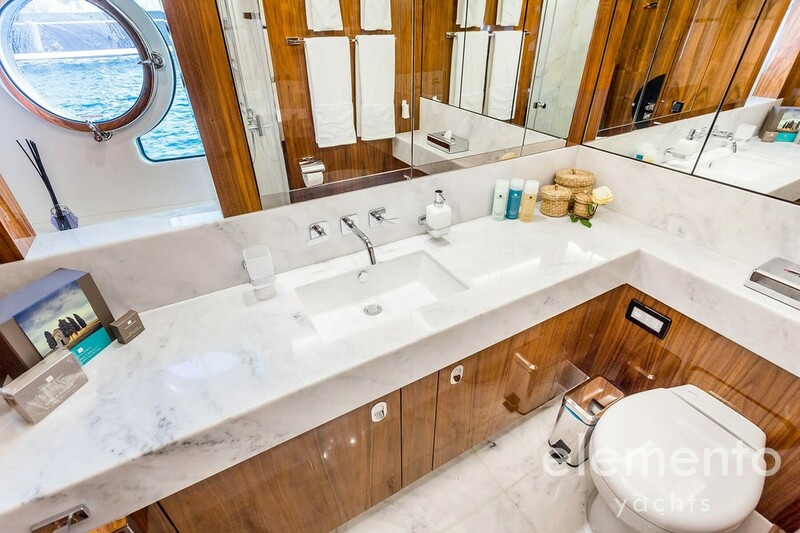 The spacious VIP cabin in the bow of the yacht has a TV, a dressing room and a bathroom en suite. 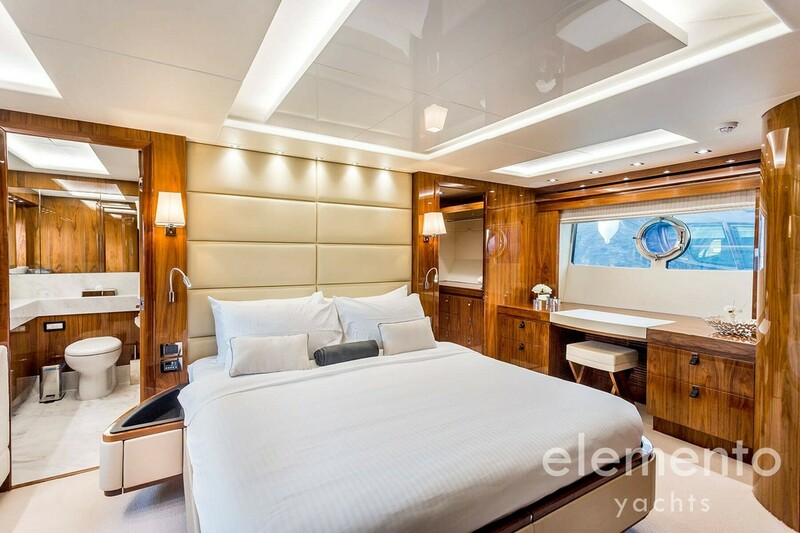 Midship is the master cabin, which extends over the entire width of the yacht. 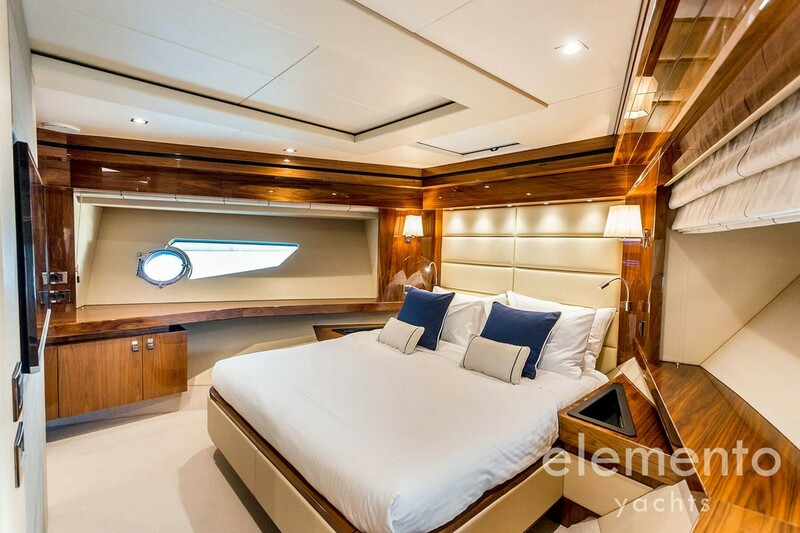 There is a king-size bed, a TV, a dressing room and a bathroom en suite with shower. 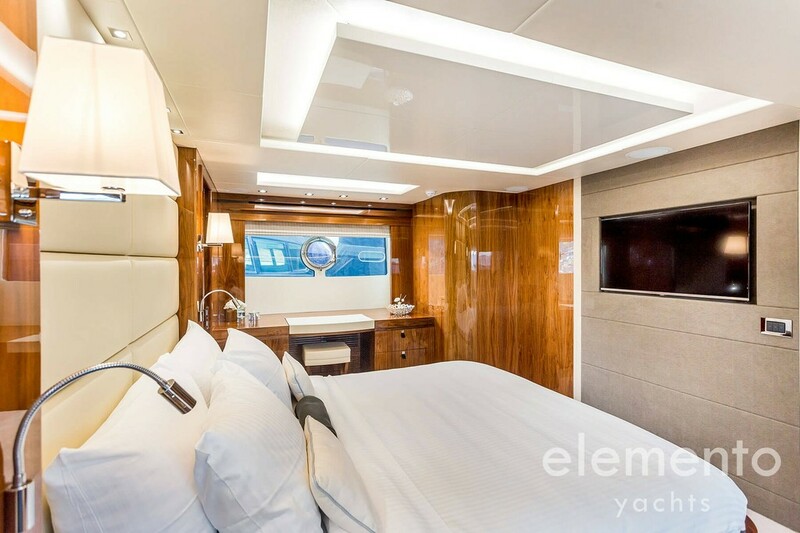 The two double cabins have adjustable beds. 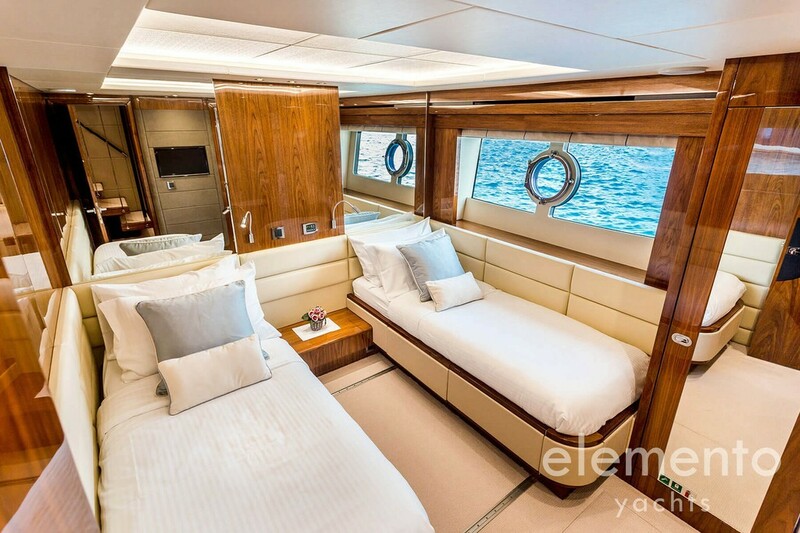 This realizes either two single beds or a double bed. 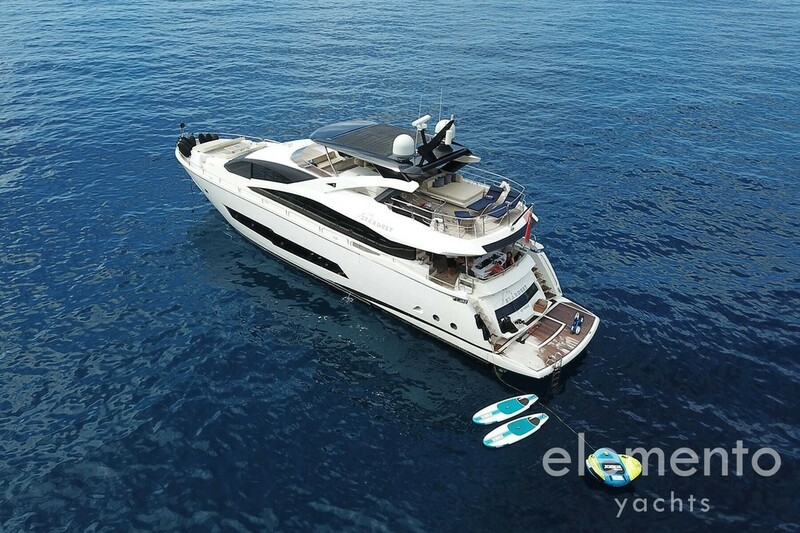 The super yacht “STARDUST” — Sunseeker 86 Yacht is perfect for an unforgettable yacht charter on the Mediterranean between Majorca, Ibiza and Menorca.